Founded in 1974, the Museum is a place where machines of a bygone era are celebrated through conservation, preservation and demonstration. Unlike many museums, OHTM;s collection is primarily operational, offering visitors a spectacular and rare experience at a number of outdoor event throughout the year. Care and maintenance of these historic vehicles aircraft requires the attention of a small but mighty staff and an extensive, dedicated volunteer network. The Museum started with a handwritten note on the backside of a graduation program. It was mailed to Jim Rockefeller, who had a grass airstrip on the side of a mountain in Camden. The message was from Tom Watson, who had his own grass strip next to his North Haven Island summer home in sight of the Camden Hills. The two had met previously through their love of aviation. That handwritten message read: “Wouldn’t it be nice to have some old airplanes flying around Owls Head.” There was no question mark at the end of the message. Tom was head of IBM, and he didn’t use question marks. This small gesture catalyzed a much grander plan. Jim, a builder of boats and airplanes, asked his friend Steve Lang if he would like to help spend some seed money that Watson said he would put up—if a place to fly old airplanes at the Rockland Airport could be obtained, and if the flying might be supported by the community in some way. Tom enjoyed combining business with pleasure. The word “museum” was bandied about as a plausible excuse to fly old airplanes. Cars were not mentioned at the time. The undeveloped land at the end of old Runway 17 was obtained from Knox County under the concept of a cultural park. It had been earmarked for an industrial park, which did not sit well with the locals. Owls Head was delighted to unload the problem. There was no access road. The seed money was spent to put in a dirt road. Paperwork was drawn up to form a nonprofit museum with a mission based on demonstrating the flying of old airplanes. 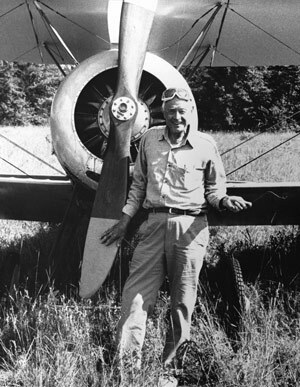 Next Lang and Rockefeller came up with the idea of a rally featuring old planes, cars and engines to arouse interest. 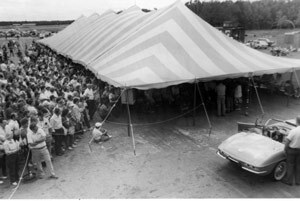 In 1975, wings, wheels, old engines and contraptions of all types and people of all backgrounds gravitated to the first official Museum Rally. A 1912 Curtiss Pusher flew overhead, while vapor engulfed a Stanley Steamer whistling by. High wheel bicycles, chugging old engines, and hundreds of antique cars were enjoyed by thousands of visitors at the first event of its type ever held in Maine. From the inaugural rally, the Museum began to grow. In 1976 Charles Chiarchiaro was offered a full-time job by Rockefeller and Lang. This followed a car ride to West Paris, Maine to save a steam engine from the wrecking ball. The talk was not focused on objects alone, but more importantly on the people of Maine and the vision of a museum where skills were shared, vehicles demonstrated, and imaginations ignited. 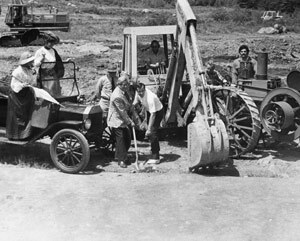 Orchestration for the 1976 second Annual Rally and grand opening of the new museum began. The dirt road, covered with oil weekly to keep the dust down, brought visitors to a 40’ x 80’ building with two planes and two cars. Like the start of any enterprise, stuff happened, some of it less than ideal. With the cold winds of winter pipes froze. With the warming winds of spring it was a challenge to hold back the flood waters. Sometimes overcoming challenges are what makes the place. An increasing number of trustees, volunteers and eventually staff formed a cohesive team, with the realization that a museum without the dedicated involvement of all types of people cannot be a true museum, no more than a house without people can be called a home. The Museum is a community of energy, excitement, collective human resources, compassion and commitment. This was the founders’ vision, and has in great part fueled the Museum’s success. The collection has grown from two automobiles, two aircraft, a high-wheel bicycle and a 100-ton steam engine to an internationally recognized collection of landmark vehicles and related technology. The combination of people and a collection that is maintained and exhibited in operating condition provides a special experience. This has become a detail and a calling card that has served to distinguish our museum throughout four decades. Your ongoing support will bring new images, memories and smiles. We have never felt better about the opportunities the Museum will be able to offer with its focus on family, education, community partnership, the ever-increasing level of excitement, and ability to inspire. The Museum has come a long way, but it is just a start. Groundbreaking for new lobby, office main entrance building. The 1976 Rally attracted thousands of visitors, new friends and members. Parking was out of control! 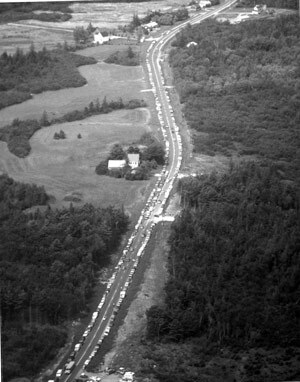 Bird’s-eye view of an early Auto Auction Event. 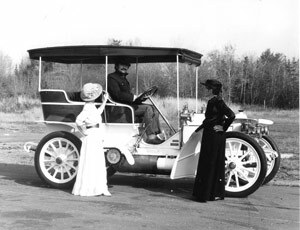 Charles Chiarchiaro at the wheel of the 1908 Mercedes Simplex with Margaret (left) and Elsie. 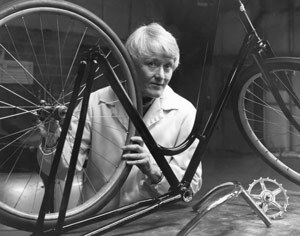 Marge “Tin Lizzy” Kincaid restoring an early cycle. 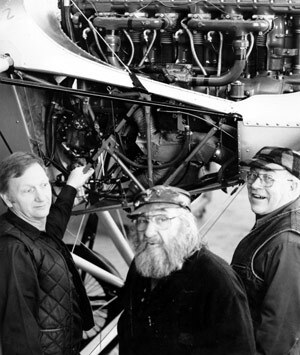 (left to right) Leo Gallant, George Curtis and John Kincaid, three founding Volunteers. Founder Tom Watson after a close call and unscheduled landing in Owls Head field, far from home. 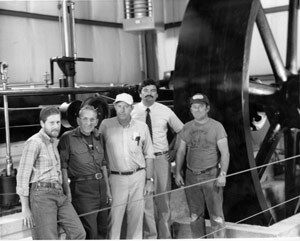 The Corliss Engine Gang (left to right): Steve Lang, Ken Smith, James Rockefeller, Charles Chiarchiaro and Bill Smith.